On Monday, June 6, we decided to take some profit off the table by selling Equifax (EFX) the top performer by rate of return in our Dividend Growers portfolio. Although we still think EFX is a fantastic company with excellent financials and sound management, a few signals suggested that it might be time to exit, at least for now. Here is the Dividend Growers portfolio sorted by IRR since inception. 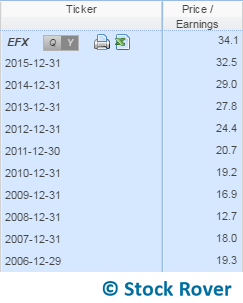 As you can see, EFX is the top performer by rate of return. It is the third best performer in terms of percent of the portfolio’s total return (other top performers PRU and AMGN started with slightly higher allocations). You can also see from this table that there have been some real dogs in the portfolio so far. We’ll be reviewing the fundamentals for these poor performers soon to see if they are worth keeping. For example, Foot Locker has been a disaster, but its fundamentals remain strong and we feel optimistic about the industry, so our long-term thesis hasn’t changed (see this article for a good summary of why we like this stock). Our long term thesis for Equifax hasn’t changed either. The information solutions company put up a strong first quarter and continues to be a well run, growing business with diverse sources of revenue. Although we still see EFX as a quality company and solid long-term pick, the series of charts below will help show why we decided to sell. 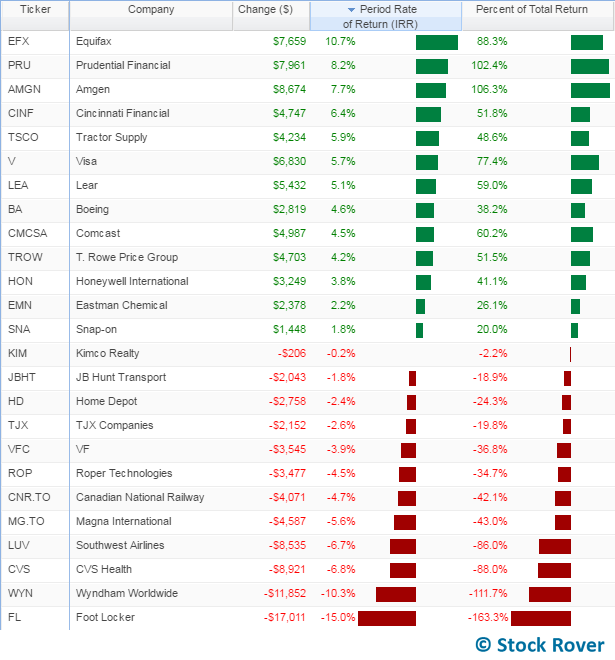 At the top, EFX is charted in dark blue against its industry (light blue) and sector (light green) over a 1-year period. As you can see, it has beaten them both, handily. The inception point of the portfolio has been marked with a star. 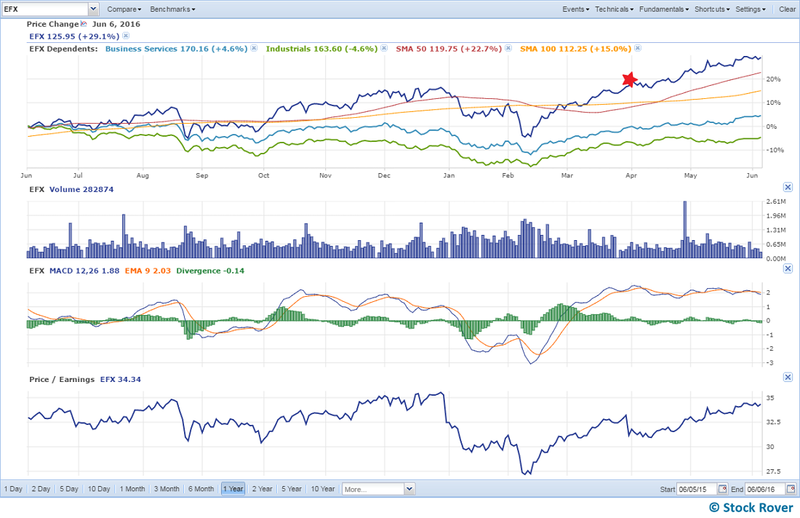 The 50-day simple moving average (SMA 50, in red) and 100-day SMA (yellow) show us what is already obvious from the price chart alone: the stock has upward momentum. Note that we also ran this with a 150-day SMA and the result was very similar. This could indicate that the stock is running out of buyers at the higher prices. 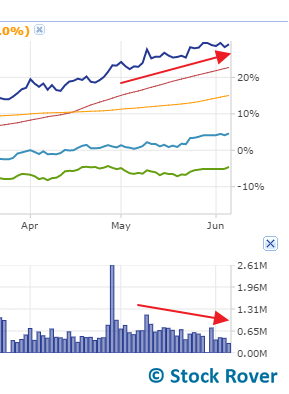 In addition to the chart shown here, we also looked at 3- and 6-month volume-by-price charts, which support the notion that EFX may be hitting a resistance. This could be a fakeout as the signal line and EMA are running close to each other and therefore mingling often (a few recent bearish crossovers turned out to be nothing, as you can see above). Plus, as we already saw, the SMAs suggest that the stock has momentum. 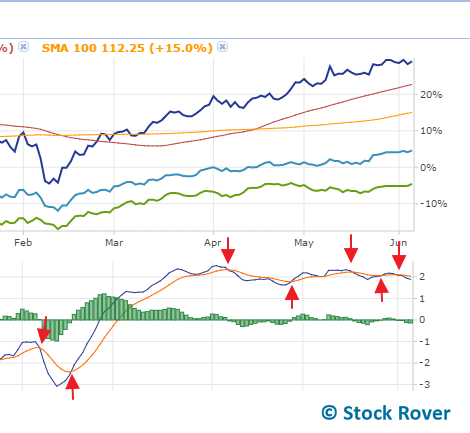 However, SMAs are a lagging indicator and often do not provide an optimal buy or sell signal. The MACD tends to provide a more immediate signal than SMA crossovers, so if we are going to sell, we prefer to do so at a bearish crossover on the MACD, as we have just done. The fourth and final chart is the most important for the sell decision. It’s the price/earnings (P/E) for the past year. Basically, EFX is expensive. It was expensive when we bought it with a trailing P/E of 31 but it’s even more expensive now with a trailing P/E of 34. This isn’t the highest it has been in the past year, but it is approaching that number. After it hit a P/E of almost 36 in late December, the stock proceeded to lose 17.6% over the next two months, more than twice what its industry lost and over three times what the S&P 500 lost during that same period. It bottomed out with a P/E of 27 and then began its steady ascent to its current historically high multiple. The following table shows how the company’s valuation has crept upward over the past 10 years. All together, these charts tell us that the stock is pricey—historically so—and we think it may be hitting a resistance. That is why we decided to cash in. It’s worth noting that the company’s forward P/E is much lower, 22 at the time of writing. This speaks to the growth expected of the company in the next year. Obviously, the risk in selling a strong-performing stock is an opportunity risk: if a stock continues to rise after you sell, you’re kicking yourself. On the other hand, if you get the timing right and sell when the stock is hitting a peak, you feel like a genius. Knowing when to sell is one of the hardest things to get right in investing, in part because it’s hard to keep it strictly rational—selling can feel like a capitulation, either admitting you were wrong or simply abandoning a company that you like (see our When to Sell webinar andnotes for more on this subject). Parting with Equifax at this moment is absolutely a gamble. The sell signs are subtle and countered by some bullish signals, and as mentioned above, our long-term thesis for the stock has not changed. However, we do think the valuation is too elevated and would like to see it come down before possibly re-entering a position. Now that we’ve sold this stock at a gain of 10.7% (not bad for two months! ), we have some virtual cash burning a hole in our virtual pockets. Our next move will be to find a new pick for the Dividend Growers portfolio. Stay tuned.